Peter Otto Testmann, 1806-1890, København mv. Testman ankom Christiania med dampskip fra Kjøbenhavn den 17 juni 1843 og skulle bli i byen en tid for å daguerreotypere (se: Ny Hermoder, Bind 5 hefte 23, Christiania 1843). Det er to andre norske fotografer som fotograferte Slottet før Testman. Den første var O.F. Knudsen i 1841 og H.T. Winther som publiserte sitt prospect som litografi i Ny Hermoder bind 5 hefte 21 i Juni 1843. Testman arrived on board a steamer from Copenhagen on the 17th of June to stay in town for some time and make daguerreotype portraits. Both O.F. Knudsen (1841) and H.T. 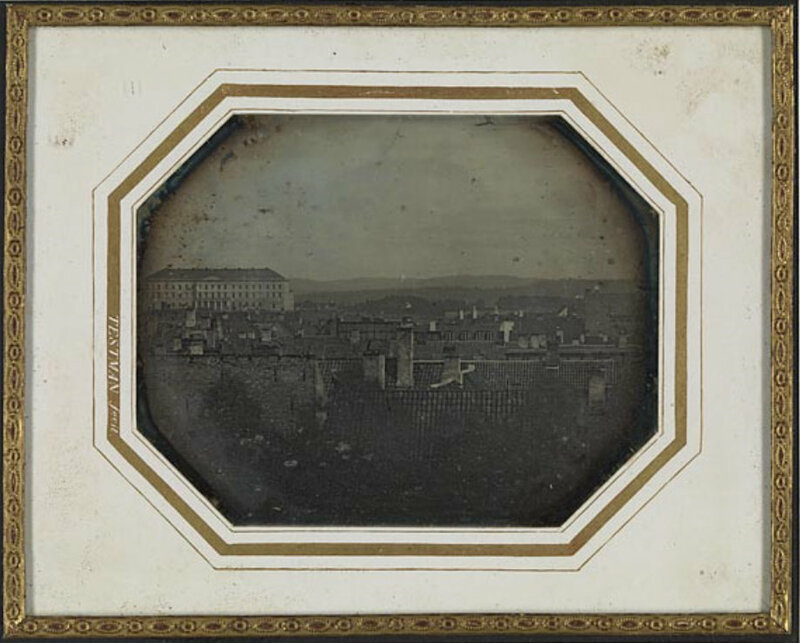 Winther (1843) photographed the the Royal Palace before him but these photographs seem not to have survived. Winther's lithograph was published in the week of Testmans arrival (see: Ny Hermoder, 5 bind 23 hefte, Christiania 1843). Utsikt over takene og pipene fra Oslo sentrum mot Slottet. Fotografert før taket og fasaden på Slottet ble bygget om i 1846. På platen gjengis motivet speilvendt. / View over the roofs and chimneys from the city center towards the Royal Palace in Oslo. The Building is seen before major changes to the facade and the roof have been carried out in 1846. The plate shows a mirrored view of the motif. Påskrift bakside / handwriten on back: "Kongeslottet i Christiania". Trykk passepartout / printed on mat: "TESTMAN fecit"